Choosing Paint Colors Without Stress! We are now smart enough to understand that not everyone learns in the same way. 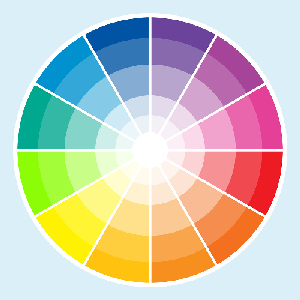 We also know that you will make your decisions on choosing paint colors according to your own style. Some of you are taken by the emotion of the color, some of you are logical thinkers, and some of you yet are the scientific, analytical types. Whatever your personal approach, I have a method to help you get to “home base”! 1)	You want your house to have a “look” or a “theme”...a country cottage surrounded by a perennial garden, or a stoic saltbox, or a seaside look done up in bright colors…or simply a palette that uses your favorite colors. You are a romantic. Gather magazine photos of houses you like, collect a boat load of them and place them in a folder. It doesn't matter if you think the photos are relevant to your house or not...simply collect them. After you get about 20-25 you will see a pattern develop of ideas/colors you are attracted to. 2)	Perhaps you are driven by the style or type of the house. You might own an urban townhouse, a bungalow, a Cape Cod. It would only be logical to give each one of these homes a color scheme which is exactly what you might expect…ultimately sensible! You are pragmatic. Niche magazines such as Cape Cod Life or 1910 are style specific and a wealth of fabulous ideas. There are many roads that lead to the same end, some are the scenic route and others are the interstate. Neither of them are any better or worse than the others unless that is, you get lost by taking the wrong road. There is an approach for every kind of person. In order to obtain paint bliss, it is good to get on the right path and follow that bliss!